Many successful concession and shaved ice businesses take it to the streets. Successful shaved ice stands pop up at all of the major events around town and our shaved ice carts and trailers will enable you to do just that. Load all of your favorite flavor syrups inside, because these snow cone mobiles will ensure that your business never has a day off! 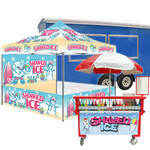 1-800-Shaved-Ice carries high-quality snow cone carts that are both attractive and extremely functional. These carts feature large umbrella tops, fun, colorful designs and a large assortment of serving features on the inside. They also come in a wide variety of price points to suit any size of snow cone operation. If your shaved ice business is a bit more serious, 1-800-Shaved-Ice's snow cone and shaved ice concession trailers are a necessity. These spacious concession trailers are large enough for you and employees to work inside and they feature wide serving windows which make the ordering process much more professional. 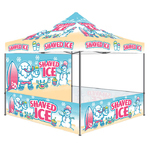 Whether you're in the market for a small cart or a large trailer, 1-800-Shaved-Ice has a shaved ice concession stand that's perfect for any operation.